Health is not something one usually associates with the hustle and bustle of downtown, but Kilbourne Group is guided by the knowledge that vibrant downtowns create smart, healthy cities. Healthy cities begin with green space, walkable neighborhoods and appropriate mixed-use density. The GO2030 Fargo Comprehensive Plan prioritizes walkable mixed-use centers in unique, dense, and amenity-rich areas. Walkable neighborhoods are safe, comfortable, and interesting. Great architecture and trees frame the walking paths. Walkability also has the essential element of being useful, meaning there has to be something to walk to. With thoughtful street design catered to pedestrians, we are able to boost walking and keep our streets safe for bikers, walkers, and wheelchair rollers. Wide streets that move traffic quickly are dangerous to cross and walk along. Unpredictable pedestrian activity, narrow lanes, sharp turns, and on street parking naturally slow traffic and improve safety. Streets can be designed for people in mind. Simple changes in our street design can help create safe, comfortable, and enjoyable environments for pedestrians. 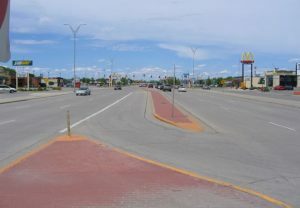 By narrowing streets, eliminating turning lanes, adding bump outs at intersections, and initiating on-street parking cars drive slower and encourage a comfortable environment for people. Frequent building entrances, benches, flowers, and a wide sidewalk also make pedestrians more comfortable in the space. Lots of window space and frequent doors on storefronts are aesthetically pleasing for pedestrians and keep walkers interested. Streets can become a destination for visitors and residents when spaces are created that people want to spend time in. Public squares, green space, and variety of retail and restaurant options all help to make a street a location sought after by pedestrians. 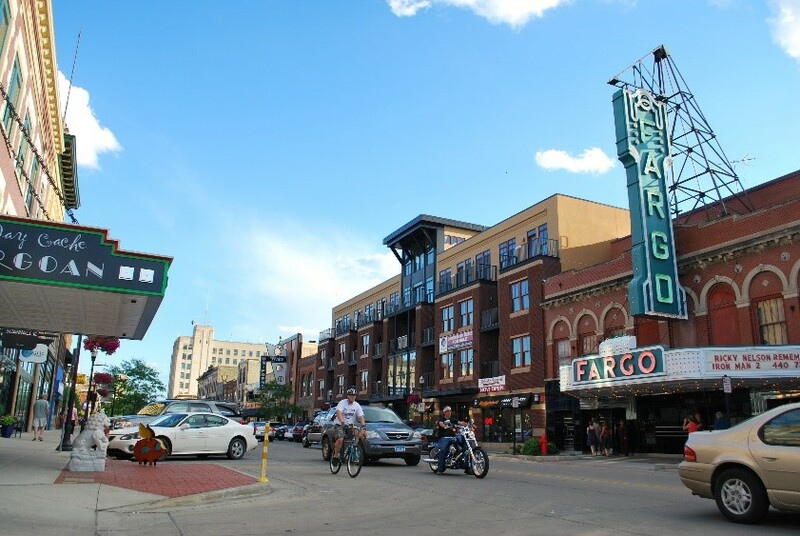 Kilbourne Group keeps these goals at the forefront when designing urban infill and renovations for historic spaces in downtown Fargo. Kilbourne Group aims to develop buildings in our city with a mix of uses. 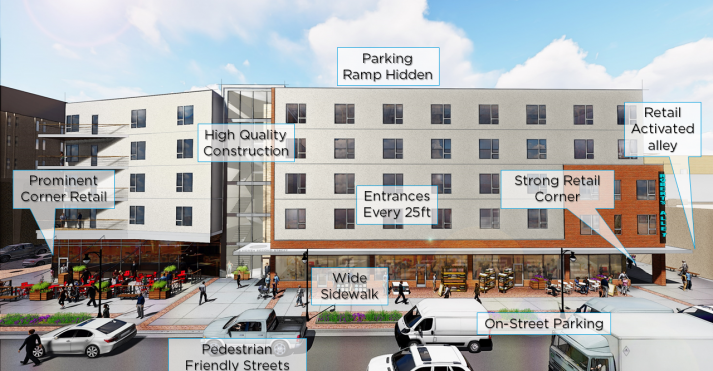 Cities become more walkable when buildings contain living space, office space, and main floor retail and restaurants. Through mixed-use infill, space in buildings is optimized and buildings meet the streets in a way that is inviting to pedestrians. 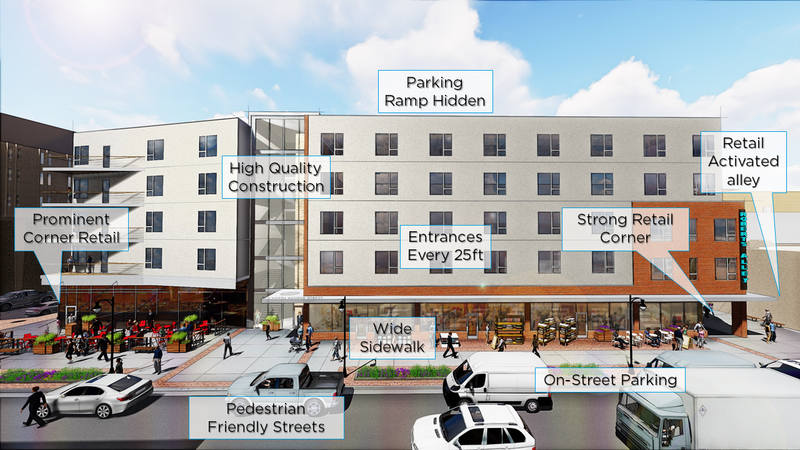 Mixed-use buildings can change based on consumer preferences. People have the freedom to choose whether they’d like to walk, bike, bus or drive to meet their needs. Walkability drives value. Every address has its own walkscore; higher walkscores translate to higher value. Walking increases creativity, reduces risk of serious health problems, and makes you happier! Aside from the physical health benefits, downtown also offers healthy fiscal benefits. Walkability: It’s not about the buildings, or even the streets. It’s about the experience. Ready to make a healthy move?